An FTC lawsuit has put the brakes on a debt collection operation that the agency says used deception to collect traffic tickets, court fines, and other municipal debts for more than 300 local governments in eight Southern and Midwestern states. According to the FTC, American Municipal Services Corp. (AMS) of Dallas illegally coerced payments by badgering people with bogus threats, including threats that people who allegedly owed money would be arrested unless they immediately paid. A settlement announced today prohibits AMS from collecting debts unlawfully and requires AMS and owners Lawrence Bergman and Gregory Pitchford to pay $350,000. The FTC says they violated the FTC Act and the Fair Debt Collection Practices Act (FDCPA). For debt collectors trying to make inroads in the niche market of municipal debt collection, the FTC’s complaint should serve as a red-light alert signaling what not to do. The FTC said that when collecting traffic fines and other court-imposed debts, AMS sent dunning letters that identified the company as the “Warrant Enforcement Division” or “Municipal Enforcement Division,” suggesting — falsely — that the letters were from a government agency with enforcement authority. What’s more, the FTC said, AMS often filled these letters with threats that were not true or that AMS didn’t know were true. For example, the FTC said, AMS often did not know if its municipal clients would try to arrest people who did not pay. Even so, the FTC said, AMS sent many of these people letters warning, “FINAL NOTICE PRIOR TO ARREST” and, “IF YOU DO NOT RESPOND NOW, EVERY EFFORT WILL BE MADE TO HAVE YOU ARRESTED.” Similarly, the FTC said, AMS often threatened that people could be handcuffed, jailed, or have their vehicles impounded unless they paid, even when AMS had no reason to believe the threats were true. The FTC said AMS used similar tactics when it collected debts for city services, like emergency medical services. The FTC’s complaint charged that AMS threatened that unpaid debts would be reported to credit reporting agencies, even though AMS never reported the debts and had no reason to believe its municipal clients reported debts. What can debt collectors learn from the case? Deceiving consumers to collect debts is illegal under both the FDCPA and Section 5 of the FTC Act’s general prohibition against unfair or deceptive practices. The FTC uses both statutes to protect consumers. If you make a claim to collect a debt, you must have a reasonable basis for the claim at the time you make it. Claims that are not substantiated are deceptive. Mere possibility is not substantiation. A warning that a certain consequence “could result” from a consumer’s action is deceptive if made without information about the likelihood that the consumer will suffer the consequence. For more compliance guidance, check out the Business Center’s Debt Collection portal. I am glad you all are on top of all the fraudulent activity that is happening in America. Great, we finally have fair play! Local governments take money from your pay check without your authorization because you work for a State Agency and you can't do "anything" about it. Even if you are contesting a fine or other disputes ... that is illegal. Thank you for stepping in and protecting our right because you are the only ones who can challenge them on the same playing field. I am getting calls asking to pay tax money. And if I don't, they will take me into custody! I have reported to the FTC but haven't received any response. I then posted at a scam call reporting site. Called from one number. Left threat to call back other number.1707-271-7945 203-484-3708. Now if we don't hear from you. 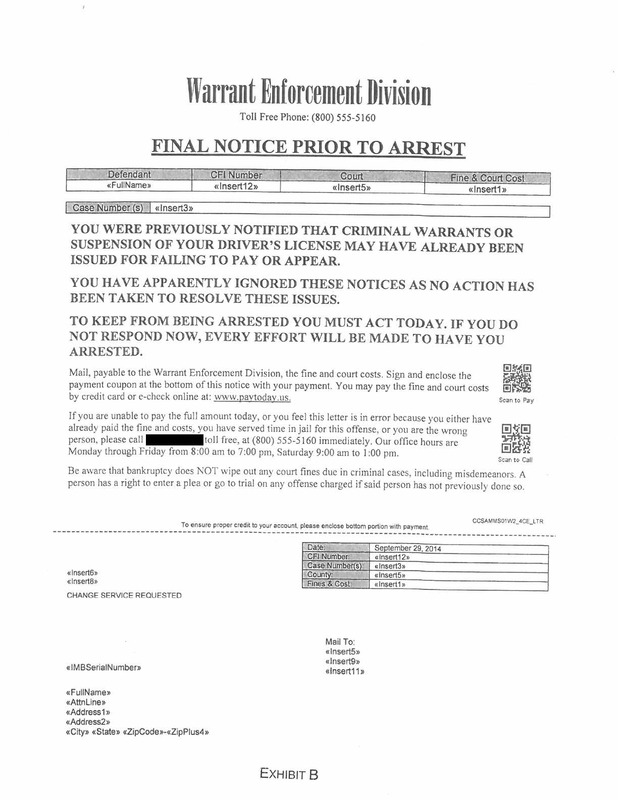 We have to issue arrest warrant under your name and get you arrested. So get back to the department number as soon as possible. Thank you.